I REALLY want to blame the refs for this one. I really do. I had the same sick feeling after the questionable Anthony Johnson elbow as I did after the DJ Byrd elbow against Villanova. 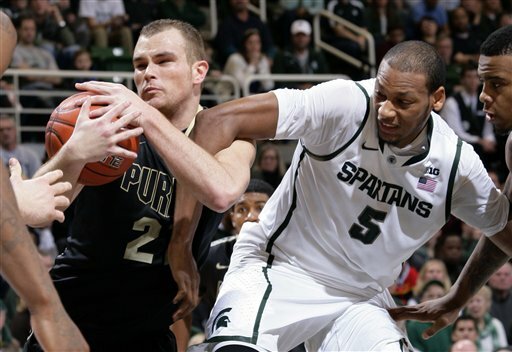 Purdue was down 43-41 with 13:15 left in the game when Anthony Johnson was fouled heading to the basket. Travis Trice grabbed Johnson's arm, and as Johnson tried to fight through the foul, he let go of Johnson's arm which in turn hit Trice in the face. Did the elbow hit him? Yes (unlike Byrd's "elbow" against the Wildcats). However, this is an AWFUL rule. I have no doubt that the foul caused the elbow. The NCAA does have precedent for this sort of rule - in football, they recently introduced a rule where if a player's helmet comes off, he must sit the next play. However, if a penalty caused the helmet to come off, he's not penalized. But OK, I'll play along. Let's give Michigan State the two shots. Why in the world do they get to keep the ball? I'm not an idiot, I know the rules. But giving the opposing team the ball after the dead ball just doesn't make sense. This foul cost Purdue TWO possessions (the possession they currently had and the possession they would have had after the foul shots) AND the two foul shots. This is an unbelievably harsh penalty for a questionable call. Meanwhile, an inadvertent flagrant-1 elbow at any other time only costs a team ONE possession and two foul shots. An elbow on offense? It's a foul so you were going to lose possession anyway - the only possession lost is after the free throws. Same with an elbow on defense - your only lost possession comes after free throws. This HAS to change. Controversial calls that could go either way should NEVER cost a team two possessions AND two points. Tom Izzo was the big beneficiary of this call and he looked sick when they explained it to him. Even Izzo knows it was unfair. The refs, on the other hand, compounded the issues. A horrible foul called on AJ Hammons clearing out gave the Spartans the ball back (and put Hammons in foul trouble). DJ Byrd then proceeded to turn the ball over, and it was 49-41 before the Boilers could even get a shot off. Remember, it was 43-41 and the Boilers were supposed to be inbounding the ball. Purdue made that next shot, and would then go 3 minutes without scoring again. By that point it was 59-43 and the rout was on. What else upset me about the refs? In that stretch, the refs waved off an and-one basket by Ronnie Johnson because they thought that somehow going up for a shot isn't enough for continuation. Less than a minute later, Branden Dawson got fouled, took several steps, and made a layup. It counted. One of these plays HAD to be wrong. All I ask for is a little consistency! And maybe some make-up calls because they had to know they were screwing Purdue. Ok, so I just wrote an entire blog post about the refs (Note: I don't always have a beef with the refs. Actually, if I wrote the Illinois recap, I would've taken at least a paragraph to talk about how lucky we were that Ted Valentine seemed to FAVOR the Boilers all game!). But they aren't the reason the Boilers lost. Purdue lost because they took too many shots without anyone else touching the ball. Purdue lost because it felt like nobody dove on the floor until the last 6 minutes of the game. Purdue lost because they were 9-20 from the free throw line. Purdue lost because they gave up 41 points in the last 13:05 (a staggering pace of 125 points when projected out over an entire game). Purdue lost a road game to a top 25 team. It's tough to get upset about that. Now it's time to forget about it, come home and pull off a big win.